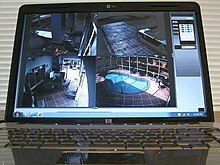 Home security is both the security hardware in place on a property as well as personal security practices. Security hardware includes doors, locks, alarm systems, lighting, motion detectors, security camera systems, etc. that are installed on a property; personal security involves practices such as ensuring doors are locked, alarms activated, windows closed, extra keys not hidden outside, etc. According to an FBI report, 58.3 percent of burglaries in the United States involved forcible entry. A typical burglary lasts for about 8 to 12 minutes and, on average, a burglar will break into a home within 60 seconds. Most thefts target cash first followed by jewels, drugs, and electronics. Common security methods include never hiding extra keys outside, never turning off all the lights, applying small CCTV stickers on doors, and keeping good tabs with neighbours. Some forecasts project the home security market as a whole will be worth $47 billion by 2020, with the DIY home security market worth $1.5 billion. While the market for home security is expanding, especially with cable TV and Internet service providers introducing their own security and home automation products, it is a fragmented market, with "a massive array of large and small rivals". The US market leader is ADT with more than 6 million households subscribed. The FBI reported that 1.7 million homes were burglarized in 2014. The same report shows that an estimated loss of $3.9 billion was suffered by the victims in the same year. Overall, when the average value was applied to the estimated number of burglaries, the average dollar loss per burglary offense was $2,251. ^ a b "Burglary". FBI. Retrieved 2016-04-25. ^ "20 Alarming Burglary Facts that Should Concern You". Alarm Relay. Retrieved 2016-04-25. ^ Blevins, Kristie; Kuhns, Joseph; Lee, Seungmug (2012). Understanding Decisions to Burglarize from the Offender's Perspective (PDF). UNC Charlotte. ^ Shinn, Jordan (15 June 2017). "The Modern Appeal to Smart Home Technology". Security Baron. Retrieved 23 September 2017. ^ Wolf, Michael. "Here's Why DIY Home Security Will Soon Be A Billion Dollar Market". Forbes. Retrieved 31 July 2015. ^ Home Smart Home, Multichannel News, Jeff Baumgartner, 2016 August 8, pg. 7.